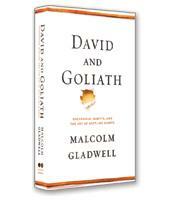 In David and Goliath, Malcolm Gladwell challenges how we think about obstacles and disadvantages, offering a new interpretation of what it means to be discriminated against, suffer from a disability, lose a parent, attend a mediocre school, or endure any number of other apparent setbacks. Launched by his bestseller, The Tipping Point, Malcolm Gladwell is a nonfiction superstar, and with good reason. As his latest book, David and Goliath, proves, Gladwell keeps surprising us with new revelations about how the world really works. In David and Goliath, he destroys an assumption that has been accepted without question for thousands of years: that the David of the Bible — and all the "Davids" that followed in the history of the world — were underdogs. In general terms, David and Goliath forces us to reconsider what we thought we knew about those with advantages and disadvantages. For example, most people believe that to grow up very poor is a disadvantage for children. 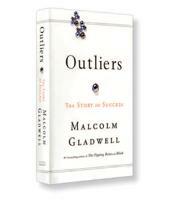 But Gladwell argues that to grow up very rich is also a disadvantage. On another topic, the accepted wisdom is that small classroom size is better for children; however, Gladwell argues that if classroom sizes become too small, the children are impeded in their learning as much as they would be in classrooms that have too many students. It's easy perhaps to make counterintuitive, against-the-grain pronouncements and perhaps even to find some anecdotal evidence to support these pronouncements. But Gladwell is a teacher, not an opinionated contrarian. In all his books, he uses a wide range of academic studies and other research reinforced with eloquent true stories drawn from history as well as from the lives of contemporary people and events around the world. What's So Bad About a Large Classroom? 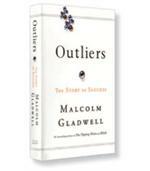 Gladwell's discussion of the impact of classroom size on learning exemplifies the depth of his research and insight. Classroom size happens to be one of the most researched topics related to education in the world. A number of global academics and consultants have carefully explored whether and how the size of a classroom impedes or enables learning in countries from Australia, Hong Kong and Singapore to numerous countries in Western and Eastern Europe to the United States. The results are mixed, at best, with smaller class sizes sometimes having a positive effect, sometimes having a negative effect, and sometimes having no effect whatsoever. As Gladwell digs deeper in the research, he discovers an inverted U relationship to small classroom size. Reducing the number of students in a large class does help increase learning to a certain point. Then the upward curve bends downward as smaller class sizes reduce learning. There are a number of factors. For example, shy or mediocre students don't get the boost to their self-esteem that comes from hearing others asking the questions with which they are wrestling. Gladwell plunges with equal depth in a wide variety of other situations in which the advantage or disadvantage is wrongly assigned by our assumptions or the accepted wisdom. For example, dyslexics or people who lose a parent young are often successful because, not in spite, of their struggles. Whatever the situation or context, Gladwell provides the evidence that bolsters his conclusions — often evidence that was available but ignored. Any historian of ancient times, for example, could tell you that the "artillery" of ancient armies consisted of men with slingshots, who benefited from greater mobility and the ability to strike from a distance than the heavily armored sword fighters. In other words, Goliath was taken out by a better soldier.